Travis owns 10 percent of Uber, which means his sale will unload 2.9 percent of Uber shares and earn him about $1.4 billion. 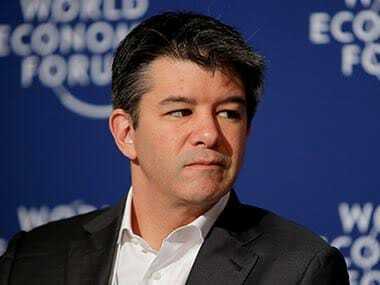 Uber Technologies Inc co-founder Travis Kalanick, who was ousted as chief executive in June, is selling nearly a third of his 10 percent stake in the ride-services company for about $1.4 billion, a person familiar with the matter said on Thursday. Kalanick’s sale is part of a deal struck by a consortium led by SoftBank Group Corp which is taking a 17.5 percent stake in Uber, mostly by buying shares from early investors and employees. SoftBank last week secured agreements from shareholders who were willing to sell, and the deal will close early this year, Uber said. The SoftBank deal values Uber at $48 billion, about a 30 percent discount from its most recent valuation of $68 billion. However, the investor consortium is also making a $1.25 billion investment of fresh funding at the older, higher valuation. Kalanick had offered to sell half of his total shares, but because there was a limit on how much SoftBank will buy, he will sell just 29 percent, according to the source. Other investors also did not get to unload as many shares as they had hoped because of such widespread interest to sell. The former CEO owns 10 percent of the company, which means his sale will unload 2.9 percent of Uber shares and earn him about $1.4 billion, the source added. A spokesman for Kalanick declined to comment. SoftBank and Uber could not be reached immediately for comment. The sale would make the Uber co-founder a billionaire for the first time, not just on paper. Kalanick has never before sold shares of the company he ran for almost a decade, the source said. The SoftBank deal offers investors and employees what could be their last chance to sell shares in a company-approved transaction before Uber’s long-awaited initial public offering, planned for 2019.